Loss is difficult, no matter how great or small. It stays with you, raw and aching, for much longer than you’d like. We are still in the first month of 2019, but already this year has brought my family three losses, and we are still reeling from them. In the first week of the year, I lost a high school teacher, drama coach, and mentor who, during those formative years of my life, played a fundamental role in shaping who I would become. He was so active in the community, right to the very end, that we all had duped ourselves into believing he was immortal. It’s nearly impossible to imagine the arts community without him, and his loss has been felt so deeply, not just on a personal level, but on a city-wide level. Within the next two weeks, we lost both of our dogs, exactly one week apart. This has been devastating for us, to lose them both within such a short period of time. Although Robbie was the younger of the two, he entered my life first, as a roly-poly little furball in 2004. 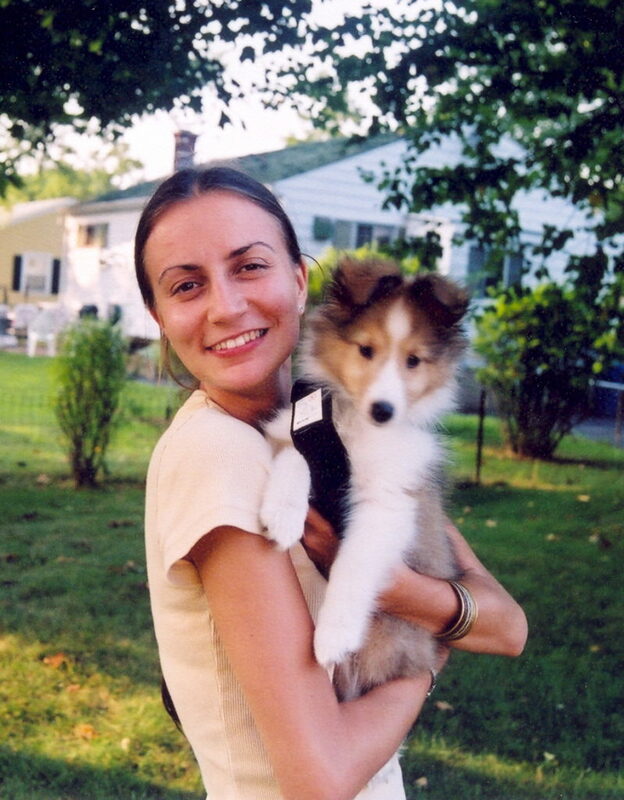 Robbie was a purebred Shetland Sheepdog, and a beautiful dog indeed. Me with Robbie as a puppy. 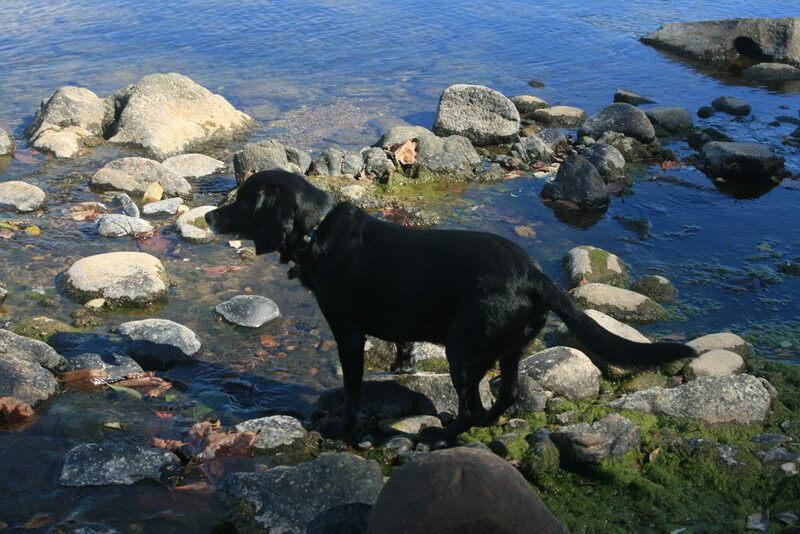 Robbie loved to herd us into one room, to patrol the back yard for stray “sheep,” and to chase waves at the beach in winter. Gordon came into my life several years later – he was a rescue, a lab/beagle mix who belonged to my ex husband. My schedule was such that I became his primary caretaker, and he came to live with me after the divorce. Gordon on the river in Little Gunpowder Falls, MD. Gordon and I shared many adventures, both good and bad. He was the consummate scrounger, always breaking into our cupboards and pantries to steal food while we were away. We had an elaborate system of locking up garbage and food, but he still managed to get himself into trouble. And yet, he was a constant companion for me when I was struggling through many long months of severe morning sickness. His quiet, calm presence helped me through many stressful moments. He was my companion before, during and after my marriage, and his very existence was like a lifeline of stability in turbulent waters. 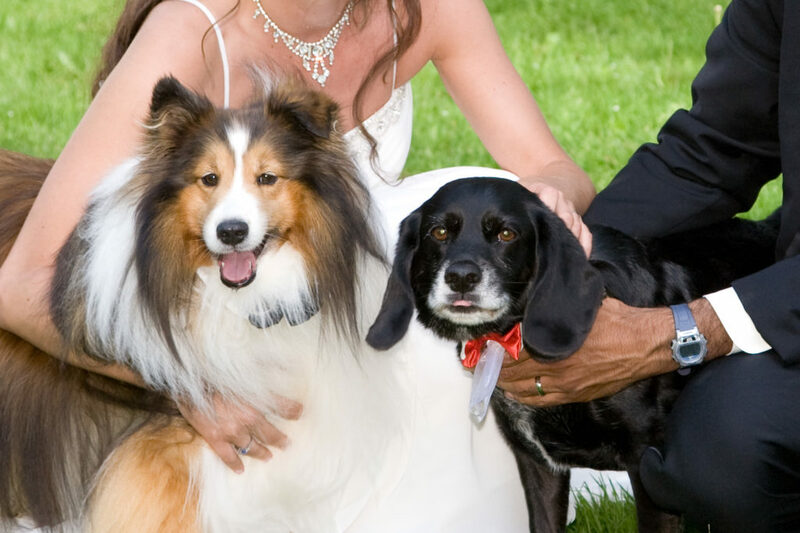 Robbie and Gordon were the “ring bearers” in our wedding. They wore the rings in pouches under their bow ties. Robbie and Gordon, like most children of blended families, took some time to get used to one another. At first there were some tense moments, some scrapes over territory, peeing in each other’s beds, etc. But after a period of time, they grew to be great friends. By the end, they were completely inseparable. Robbie seemed to cure Gordon’s separation anxiety, and he no longer busted into our food cupboards. Robbie would sleep next to Gordon at night. I truly believe that Gordon died, at least in part, of a broken heart after losing his long-time companion. He only lasted one week after Robbie’s parting. The house is uncomfortably quiet without our dogs. Little routines, however inconvenient, come back to us throughout the day, and while it is “easier” to go about the day without caring for our two elderly companions, we dearly miss those efforts, those routines, those sacrifices. I find myself tip-toeing into the family room at 5am, worried about stepping on a sleeping dog, until I realize that I need not worry any longer. I find myself thinking about our hikes in earlier years, our moments of hospice at the end. I find myself filling in those empty spaces with the soothing routine of knitting – it certainly doesn’t erase the rawness, but it does apply a salve to the pain of loss. As we move through this year, it will forever be marked by the sadness of its first few weeks. We miss you, Jim. We miss you, Robbie and Gordon. Find a warm, sunny spot for us in the hereafter. Sorry to hear that Robbie died. He was a very nice dog. I understand the loss of a dog too. Ours died several years ago and I still miss him. Thank you so much Elizabeth. I know you knew Robbie well. I hope they are all having fun together in the great big dog park in the sky. But it’s hard for those they leave behind!